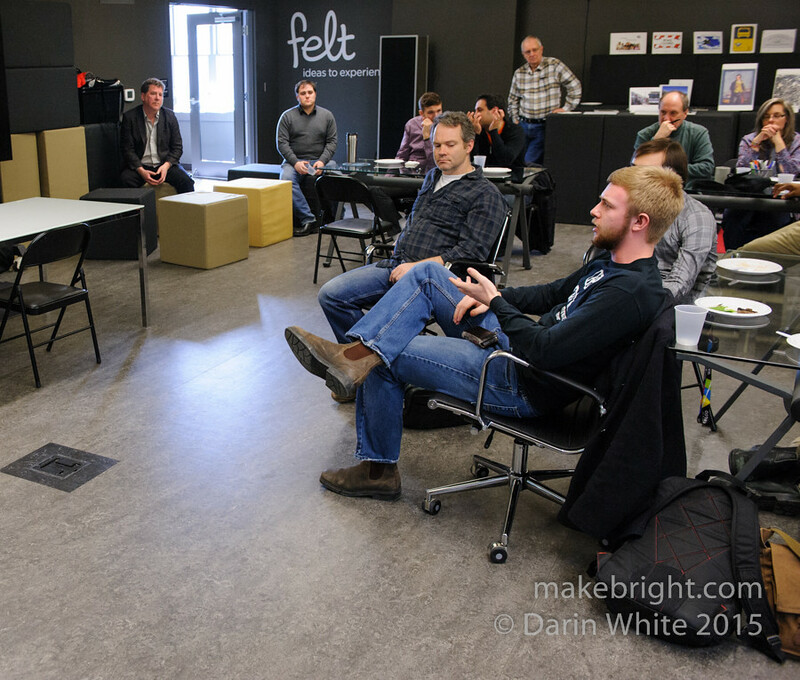 Last month I stopped by the REAP’s Felt Lab in St Jacobs to see a talk by the folks from Palette. 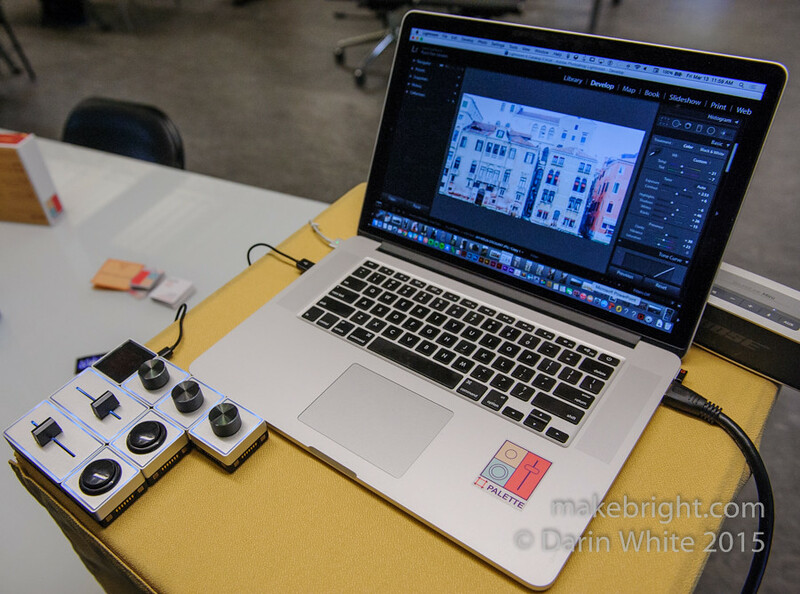 Palette makes configurable, USB-connected physical controls like sliders, buttons, and knobs that allow you to drive your software in ways beyond the usual mouse and keyboard. Above, Palette hand model and Community & Marketing Manager Ryan Van Stralen (rhymes with Van Halen) is hitting a button on the demo rig. 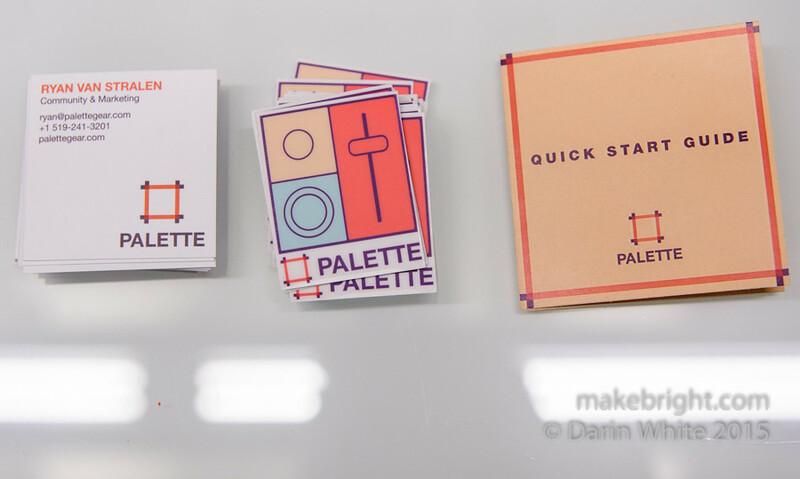 I first heard of Palette in the days before our FLASH photo show back in January. Company founder Calvin Chu reached out to see if there was a fit for his gear with FLASH, but with only two days until the event we were in full execution mode and couldn’t afford the time to explore that. 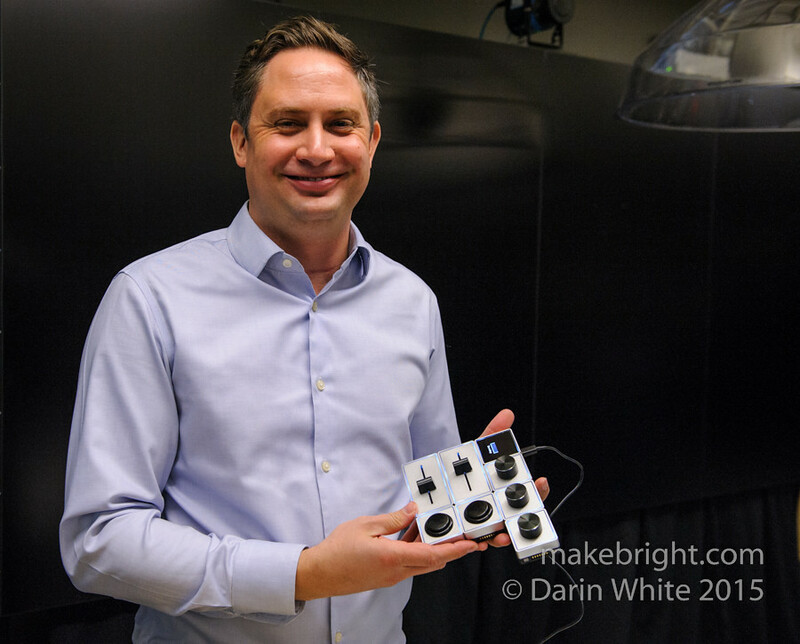 However post-FLASH, I went back to check out this company and product coming out of UW’s Velocity Foundry hardware incubator and was intrigued on two counts. First, I’m a heavy Adobe Lightroom user in my photography and I’m always looking for ways to more efficiently drive my post-processing. The second point of interest takes us all the way back to 2006 when I was building a MAME arcade gaming rig and looking at prior research on connecting DIY electronics to computers via USB. 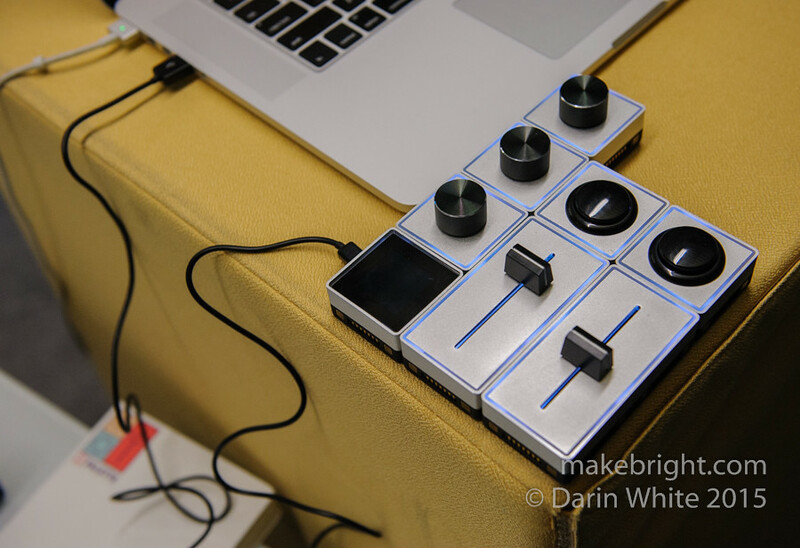 Back then, I discovered a wicked open source project called CREATE USB Interface (mirror) by a smart fellow named Dan Overholt out of UC Santa Barbara. Dan’s rig based on a Microchip PIC 18F4550 (aka tiny-computer-on-a-single-chip) utilized the integrated USB peripheral to link homebrew electronics to a PC as an HID (Human Interface Device, like a keyboard). I built the circuit he designed and flashed it with my own program to map button presses from my game controls to the game emulator running on a laptop. Pressing a button on my fly-wired board made a ‘j’ appear on the laptop and by that mechanism I was able to drive the whole game emulator. At the time, this amounted to magic. Back then Arduino had just been born, though it still used an RS-232 serial connection rather than the now more familiar USB link. 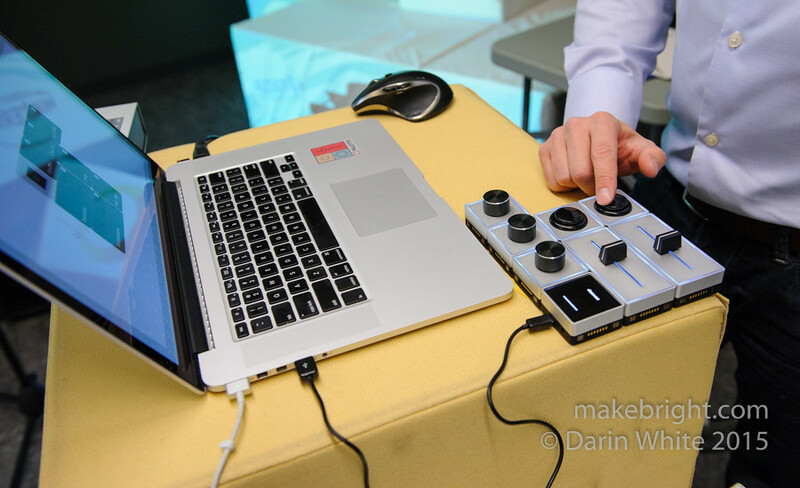 Dan’s goal was to enable artists, electronic-musicians, and mere mortals to hook their rigs to the increasingly dominant USB port. Fast forward to today when both serial and parallel ports have been dropped from laptops in favour of USB. Virtually every microcontroller vendor now offers chips with integrated USB. The de facto platform for makers everywhere, Arduino, now produces some boards with chips like the ATmega32u4 on the Leonardo that have built-in USB capability. The point of this digression is to illustrate that it’s still kind of complicated to make USB peripherals, and twice as hard to make them easy to use. Therein lies the magic of Palette. Ok, well for me the magic is that the modules click together with awesome frickin’ magnets and the configuration UI automagically knows how they are arranged. The team has also done a lot of legwork with software vendors to get deep integration with popular packages like Adobe’s Lightroom and that makes all the difference. I’ve got some more photos for you on the other side, but first a shout out to my friend and REAP workshop shepherd Joy Smith for the invite. You should all go to a Friday REAP jam at some point. Power and interface brick, upper left. Endless-turn knobs at top. Buttons upper right. Sliders at the bottom. I dig the industrial design of extruded aluminum and especially the multi-colour LED lighting around the bezel (blue here). I vaguely recall there is some practical limit to the number of modules you can hook up, probably constrained more by power (500mA?) than by bandwidth. 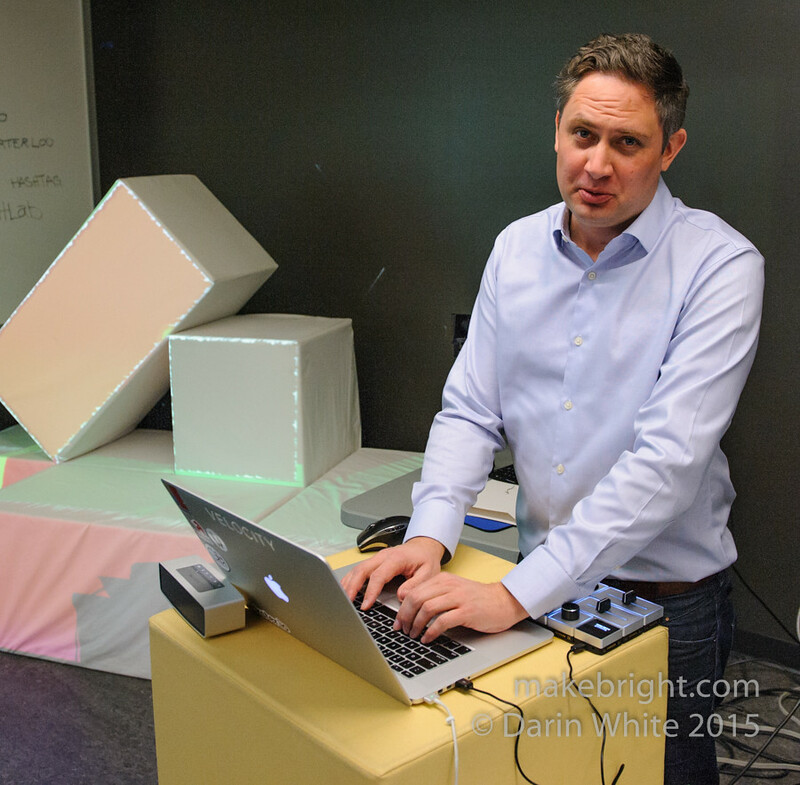 Ryan asked for volunteers to configure the demo setup for Lightroom. Hand shot up. Me, pick me! This wizard is a breeze, and doubly so if you are familiar with the target software. See, these Lightroom options are all in the same old familiar order as in Lightroom itself. Palette is all partnered up with Adobe for integration and access to upcoming versions. 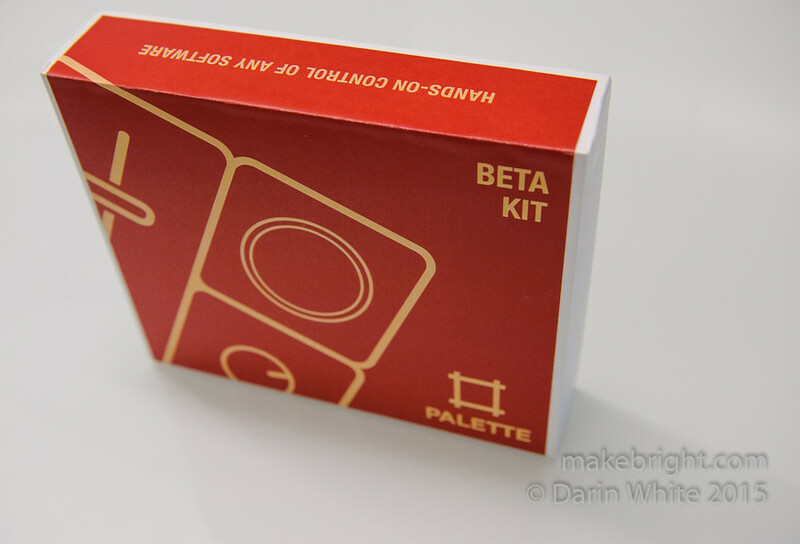 I was delighted to hear that Palette has API access to User Presets. Useful. Team. 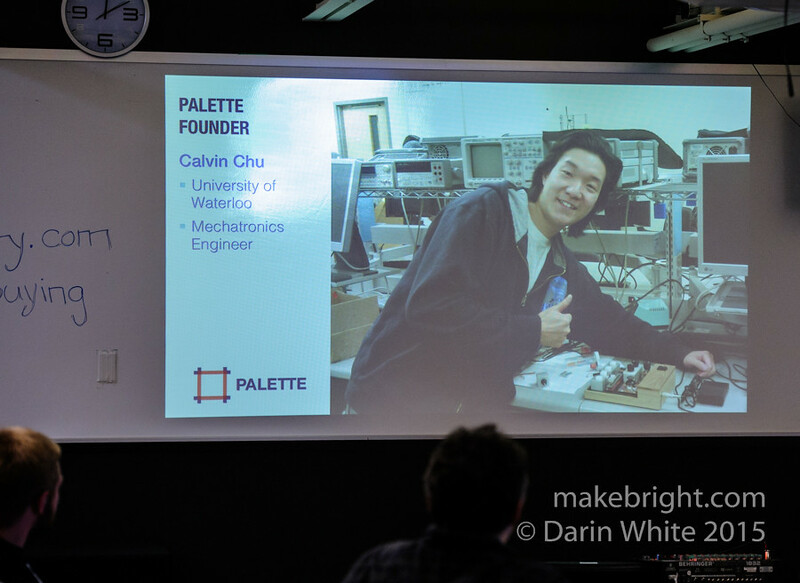 This crew is coming out of the University of Waterloo’s Velocity Foundry hardware incubator program. 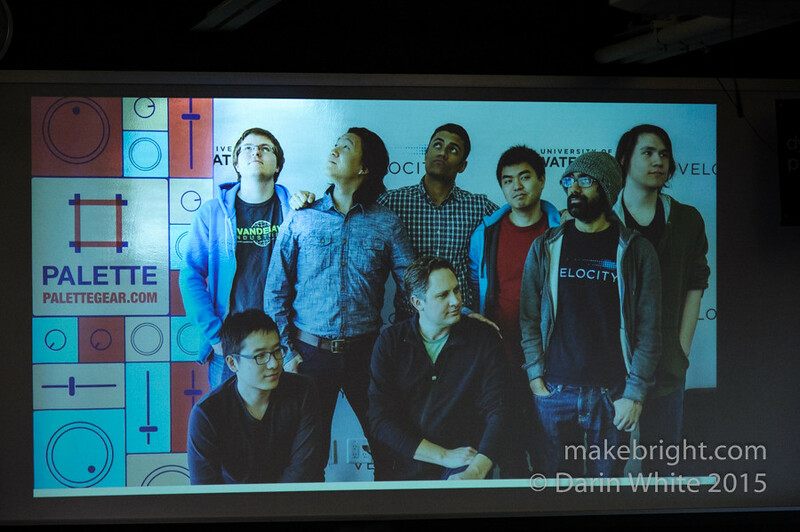 They’ve also done a stint in the Shenzhen-based HAXLR8R incubator in China. That’s particularly relevant when you consider the short time between prototype and upcoming final production run. 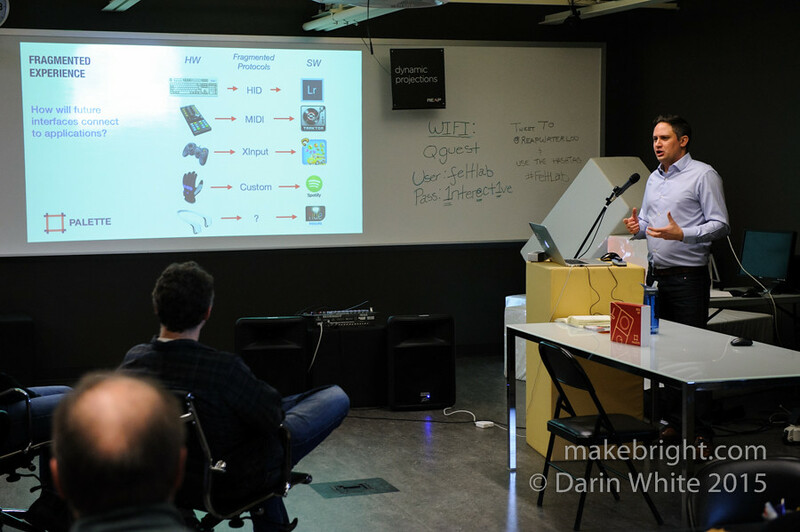 I’m seeing hardware startups partnering with HAX with increasing frequency. That’s great for the ones that get in the program, but leaves the hardware ecosystem here in North America under-developed. 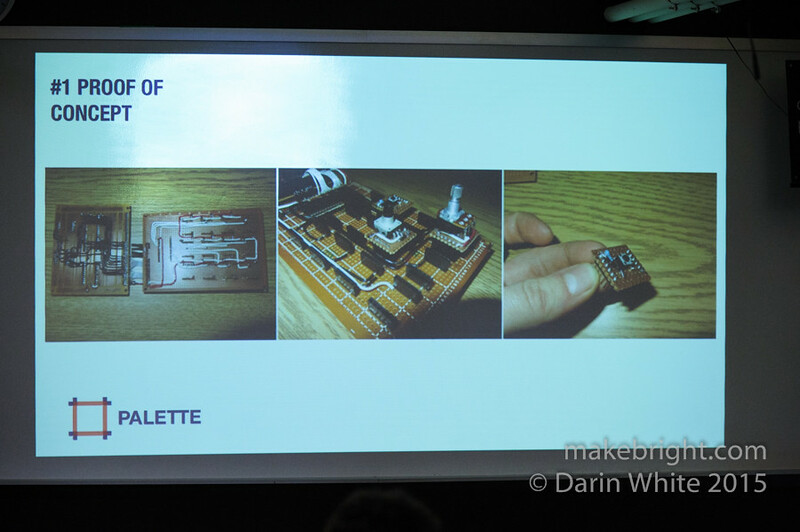 I’m looking/hoping for a hardware incubator here that serves makers beyond the student stage. I think it can happen. Here are a couple of things upon which I ponder when considering purchasing Palette. The first thing is that this would be yet another thing I would have to carry in my nomadic approach to modern life. In addition to all my camera gear, laptop gear, and lunch. Even at home I tend to edit photos on the sofa while watching back-catalogue TV shows from the 70’s. 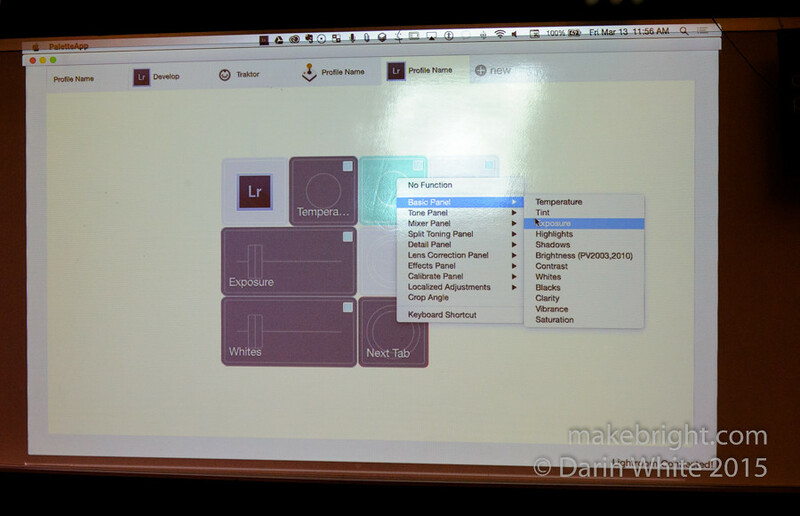 The second thing is that in Lightroom I’m a pretty serious number typist versus slider explorer guy. So if we take Exposure for example, rather than grab the slider, I will instead just type “.2” in the box beside it to lighten the exposure just that much. I think that’s generally faster than using the virtual on-screen slider and I wonder if it would be faster than the Palette slider. Open questions, I guess. But those magnets are so compelling. And yes, I know you guys worked so hard on all this other stuff and I’m dazzled by simple magnets. Fun fact: Ryan is a graduate of UW’s Fine Arts program. Nod to Ryan for solid product knowledge. From King Street North, this is St Jacobs. This entry was posted in fieldtrip and tagged Felt Lab, St Jacobs, UX. Bookmark the permalink. 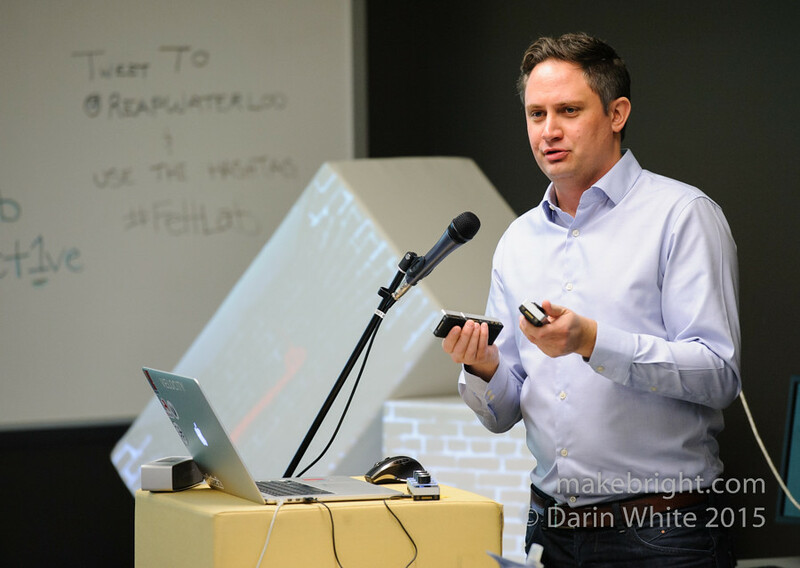 What a great article Darin! Thanks for these amazing pictures and the recap.